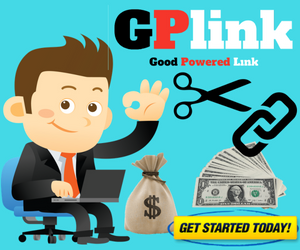 Hey guys, I know you’re here because you want to start making money with GPLinks. But may be you’re thinking, why should you join on GPLinks while you’re already working with same other website, right? If you’re new or already working on site like this but wants to know how to make exactly 10 dollar per day or more then read this full post. In this post, I’m going to review about GPLinks and will let you know how many ways you can make money from it and other features as well. GPLinks is a link shortner website found at www.gplinks.in, which looks an Indian website, I mean founded in India. It is a completely free tool where you can create short link. You can manage your links, protect your links and easily make money comfortably working from home. Why should you join with GPLinks? What is highest CPM rate offered by GPLinks? GPLinks provides highest CPM rate for USA, UK and other premium countries and the rate is above $10 per 1000. Country like India also getting good CPM rate is above $6 that is only on GPLinks. No other link shortner website provide such amount for Asian countries which made difference this company. You can simply check the rate for the country you’re residing in your account dashboard. There is some great ongoing contest available which you can participate to win Realme C1 smartphone. They will provide it to Special member of GPLinks. You can also be connected with their Facebook page and YouTube channel for any ongoing promotion and bonus. How many ways can I make money from GPLinks? There are only two ways available to make money with it. One, shortening a link,. Two, referring your friends and family. How to make 10 dollar per day with GPLinks and Why it is different from other short link website? Simply share your shorten link with your friends, share it on social media, own blog and online forum. Write a good post about it on any platform and put your referral link. It is not as easy to make $10 per day but most of the members earning more than that each day. They have excellent WhatsApp support Agent, with who you can contact for any issue to sort out. You can simply ask any question through call or chat (as example: link not working or payment request, payment method or others). You can also email them mentioning your problem which they will sort out soon. There is no other link shortner website like GPLinks who care their members and that’s why it is completely different than any other site. How to set up full page script on your own blog or website? It is simple and easy. You just need to register and login to appear in your dashboard. And scroll down website page, select ‘Tools’, then click on Full Page Script as image shown below. How does full page script works? GPLinks full page script transform all your links into the ClickFly form which is pure magic means huge earnings opportunity. You just need to copy and paste the code shown on the above image to the body section of your HTML code in your blog or website. You can simply include or exclude the domains that you want to shorten. It’s easy. How to short a link manually – you might ask to know about? After logged into your account dashboard, you will need to click on ‘New Shorten Link’, then ‘Type your blog or website link” in the blank form as shown on the below image to create a shorten link. You can check your earnings statistics in the dashboard. How to withdraw money from GPLinks and What is the minimum amount required to cash out? As an active member you will be able to withdraw the money you’ve earned which is reached minimum threshold. One thing you must know that your profile should be fully completed to withdraw money from GPLinks. You can get paid by Paytm (minimum $1), Skrill (minimum $5), PayPal (minimum $1), Bank transfer (minimum $1), PhonePe (minimum $1), Perfect Money (minimum $3). As well there is many other payment method available to withdraw. It is very good for those who are using payment processor like PayPal or Paytm to enjoy minimum $1 withdrawn amount. Is GPLinks Legit or Scam? Most of the link shortner website are not scam and they are paying. Gplinks same like other honest website. There is many payment proof on YouTube and other reliable sources we get from which shows that GPLinks is a very good, honest and paying website and that is legit but not scam. If you find this post helpful please leave your feedback in the comment and also if you want to share your own experience feel free to write at admin@shouter.review. Thanks and have a nice day. Wishing a good earnings for you. 100% Legit!! or Scam!!! See inside, Vilo Video App Review: Earn Over 50 Thousands Rupees Every Month – Scam or Legit?